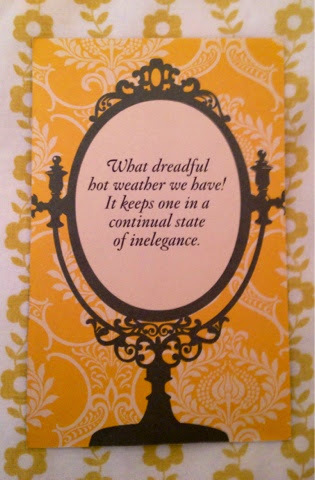 Thank you to Jane Austen for these wise words. Right, it has to be said. I hate hot weather. What makes it worse is that when I say hot I am not talking about the burning heat of an August in Italy. I am talking about Britain's pathetic attempt of a summer. If I can't wear layers and wooly tights then it is too hot! I am the sort of person who counts down the days until I can get my huge parka out of the cupboard and gets stupidly excited at the prospects of a harsh winter. So you may be wondering why I felt the need to make this short and seemingly irrelevant post. Well, firstly I am conscious that I have been lacking when it comes to updating my blog (blame university) but secondly, I received a postcard (see photograph) from a friend with the quotation 'what dreadful hot weather we have! It keeps one in a continual state of inelegance'. It came during an uncharacteristically warm spell in October and it goes some way to explaining my dislike of hot weather. *Did I really just write a blog post on the weather? How terribly British of me. We just got hit with such a bad snow storm that my university is closed today. You want cold? Michigan is waiting for you ;) And I would be happy to escape it! I cannot stand winter! I don't mind the snow but the bitter biting cold is just too much for me.